Three fresh deaths were reported in Darjeeling district taking the toll in north Bengal to eight since the earthquake shook Nepal yesterday. Over 50 are under treatment at hospitals across the region. As a round of tremor shook Siliguri last night, Gyanranjan Das, 81, and Biren Das, 72, both from Baghajatin Colony in Siliguri, died. Sources said both tried to come out of their homes but fell down and suffered cardiac arrests. "I have met their families and expressed my condolences. Both were rushed to private clinics and doctors pronounced them dead," said former minister and CPM leader Asok Bhattacharya. In Mirik, 50km from Siliguri, Pushpa Pradhan, a 70-year-old heart patient, died during the tremors. Fresh tremors were felt in Darjeeling and some other parts of north Bengal this afternoon and people rushed in panic. "This afternoon, 22 people came to Siliguri district hospital, 12 have been admitted and the rest were released after first-aid. Among those admitted today, 10 needed medical care. Two have suffered injuries in their limbs. In total, 39 patients are under treatment since the earthquake struck yesterday," Asit Biswas, the chief medical officer of health, Darjeeling, said. Siliguri MLA Rudranath Bhattacharya visited the hospital. "We are providing best possible treatment. The chief minister visited the hospital today and we apprised her with all relevant details." Today, officials of Siliguri Municipal Corporation held a meeting. "We will conduct an extensive survey and assessment of buildings that have been damaged. A team of engineers and officials of our building cell will do the survey," SMC commissioner S.W. Bhutia said. SMC sources said according to preliminary reports, around 2,000 buildings have suffered different degrees of damage. 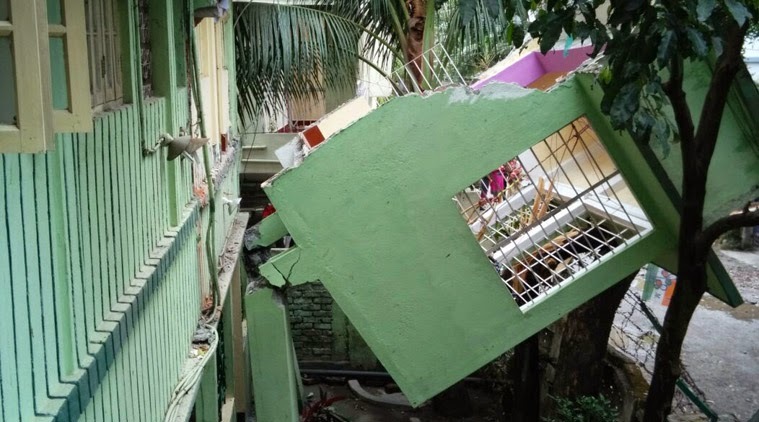 "While most have developed cracks in ceilings and walls, there are cases where boundary walls or a portion of a building has collapsed," said a source. In Darjeeling, GTA has asked all schools to shut down for the next 40 hours starting tomorrow. Colleges, where exams are on, have been kept out of the purview of the directive. In Siliguri, some private schools are shut. "We have decided to keep our school closed from tomorrow till April 29. We have around 1,200 students," Robin Chakraborty, the vice-principal of St. Michael's School, at Jyotinagar in Siliguri said. At Kakarvitta, the border town in Jhapa district of eastern Nepal, hundreds are waiting for buses to Kathmandu and flights from Chandragadhi airport in Bhadrapur, around 23km away. "I am from Bhadrapur and I run a business from Kathmandu. I came here on Thursday with my wife to see my parents leaving our three children at home," L.P. Shivakotay said from outside the airport. "We have not been able to contact our children since yesterday and we are trying to reach our friends and relatives so that they tell us that our children are safe." Shivakotay was seated on the ground as his wife Yashoda was speaking over the cell phone with acquaintances in Kathmandu. "Not a single flight operated between Bhadrapur and Kathmandu today. I am waiting with the hope that at least one flight will land here and take off for Kathmandu," Shivakotay said. Suryajyoti Rai said: "I stay in Mirik but my family is in Kathmandu. We were told that no flights were operating. I will book a hotel in Kakarvitta and wait for transport and flights to resume. I am fortunate that I could, only once, speak to my family today. They are safe." Rewant Bahadur Kunwar, the airport chief at Chandragadhi, said: "Our runway has not suffered any damage and signal and other systems are working perfectly. But because of some problem or the other flights did not take off from Kathmandu today. Since the earthquake, no flight has landed in Bhadrapur. There were five flights today but all have been cancelled." Netra Karki, the president of Travel Association of Jhapa, said: "Everyday, around 25 buses go to Kathmandu and three-four go to Pokhara from Kakarvitta. Not a single bus has arrived from Kathmandu since yesterday. Drivers are not ready to go to Kathmandu as the road has been severely damaged." From Kakarvitta, Kathmandu is around 450km. "We are very worried about the prospects of tourism industry in Nepal," Karki said.